Brace yourselves -- the one and only Jimmy Whispers is returning to San Diego this Saturday night, October 29 at the Til Two Club, for his second-ever appearance in America's Finest City. Anyone who attended his San Diego premiere at the Hideout this past summer knows that a Jimmy Whispers show is a must-see, and the man is destined for Big Things. Click here for the Facebook event for this Saturday's show, and click here to see this event highlighted in the San Diego Reader this week by Barnaby Monk. But wait -- there's more! Everybody's favorite champion of pizza, the amazing Slowdraw the Hungry Eskimo, will be gracing the stage. Even if you wanted to (and why would you want to? ), it's nigh impossible to resist this band, with their hooky, off-kilter pop tunes, great costumes, and commitment to not only pizza and shrimp, but also always putting on a memorable show. 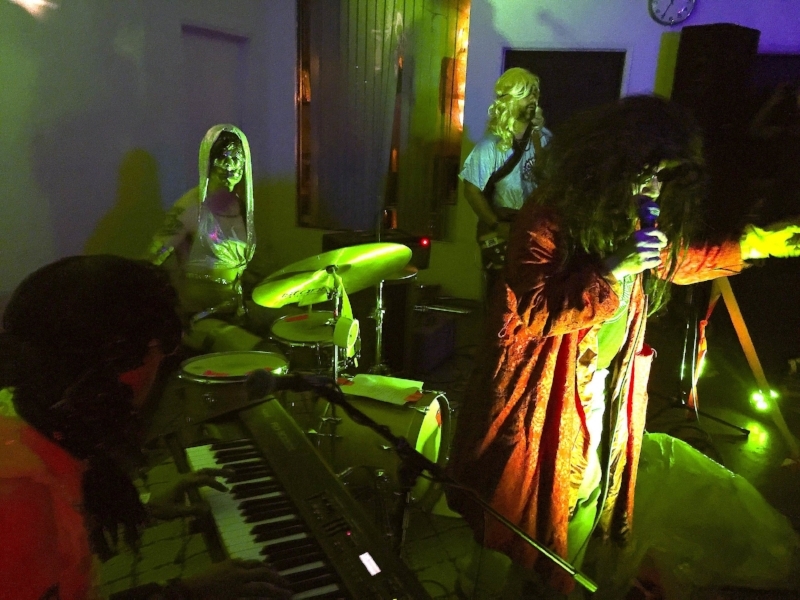 Adding to the fun for this special pre-Halloween bash is the first-ever performance by L.A.'s Native Fauna. Don Bolles (Germs, Ariel Pink, 45 Grave) dubbed Native Fauna "Infamous cult legends" as recently as this week, so join the party early to see what all the fuss is about! "Infamous cult legends" Native Fauna will be coming from L.A.
And you didn't just think there'd be singing about pizza without actual pizza on the premises, did you? Our favorites, Lefty's Chicago Pizzeria, (Jimmy Whispers is from Chicago - get it?) is warming our hearts and tummies by dropping off their award-winning slices of heaven. DJ Scary Hankins (sometimes known as his alter ego, Gary Hankins) will be spinning records between acts, and rumor has it there is even a costume contest, so clearly The Til Two Club is the place to be to get your Halloween Weekend started this Saturday! L.A. singer-songwriter Wyatt Blair will be bringing his irreverent 80s revivalism to the Til Two Club on Friday, September 23. Blair is quite a renaissance man and DIY entrepreneur, who in addition to his live shows and recordings somehow finds time to run a record store, label (Lolipop Records), podcast (the Lolipop Connection), and analog recording studio. L.A. weekly recently and endearingly described Blair's music as “Kenny Loggins for people who won’t admit they like Kenny Loggins”. Though a resident of Pasadena who grew up in Dana Point, Blair professes, "I love San Diego - it's great. It's cool [in L.A.] but I like it down south more". With Slowdraw the Hungry Eskimo, the Tic Tocs, and Anestisia supporting the Bujwah-produced bill, this one definitely warrants a checkmark on the calendar. Listen to Blair's recently released album Point of No Return (Burger Records/Lolipop) - you'll be glad you did! 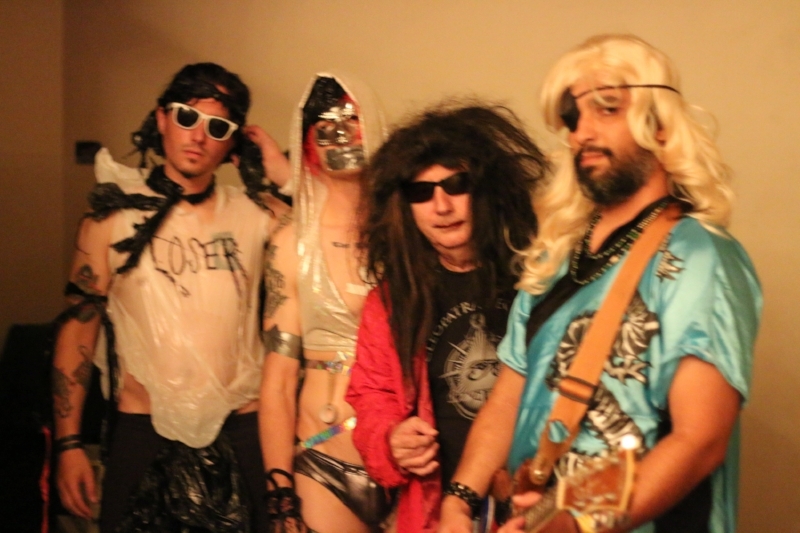 Gary Wilson and the Blind Dates, L-R: Joe Guevara, Anders Larsson, Gary, Dean Reis. Photo: Cameron Murray, 2016. It's 2016, and DIY home recording legend Gary Wilson is busier than ever. The year has already included new releases, re-releases, and performances in Chicago, Iowa City, San Diego, and Los Angeles, including what can only be called a rather epic send off (along with Jimmy Whispers) to the original location of L.A. all-ages venue Perhspace. This past week, I had a chance to sit down with my friend, colleague, and musical hero, and chat a bit about the coming months. Needless to say, there was much to discuss. Gary keeps the kids happy. Photo: Cameron Murray, 2016. Let's start with the latest offerings on wax (also available for download, if you prefer your weirdness in digital format). If you haven't heard his latest release, It's Friday Night with Gary Wilson, you are indeed in for a treat. I'd say start with "the Mermaid Song", but then again - it's an album chock full of bangers, for any fan of Mr. Wilson. It's also been a great year for archiving, with three vinyl releases of rare material: Another Galaxy (Feeding Tube), Music for Piano (Feeding Tube) and the Lord Fuzz 45, 1967 Rare Acetate (Cleopatra). Another Galaxy takes us to Gary's jazzy roots, before You Think You Really Know Me (widely understood as his recording debut, and an underground, international classic), Music for Piano offers rare, abstract instrumental Wilson work from the vaults, and Rare Acetate delves even further into the annals of Wilson history -- back to Gary's teen years, in fact. As important as these documents of recording history are, new offerings are already on the horizon for the home recording pioneer. Gary has completed a Christmas album (! ), which Cleopatra will be releasing in time to guarantee your holidays are a bit weirder than usual. "They're moving ahead with it," Gary confirmed as we sat and talked. "It's called It's Christmas Time with Gary Wilson". As if that weren't exciting enough, the R. Stevie Moore/Gary Wilson collaborative album is nearing completion, so there is plenty to look forward to in 2016 and 2017 on the recording front. Besides recordings, though, Gary is also active this fall and winter on the live scene, with appearances at Kung Fu Necktie in Philadelphia, the Meatlocker in Montclair, and "Shea Stadium" in Brooklyn on Sept. 24, 15, and 16, respectively. "I'm looking forward to it", Gary said. "It'll be my fist time performing in Philadelphia - ever. It's not too far from Endicott" And Montclair is another place I've never been to, so it'll be interesting. This won't be with the Blind Dates, it'll be with a large ensemble that has done special arrangements of my music. It's always nice to get to New York and have a lot of pizza and stuff." When Gary's had his fill of pizza in the Big Apple, he'll be back on the West Coast for more adventures. 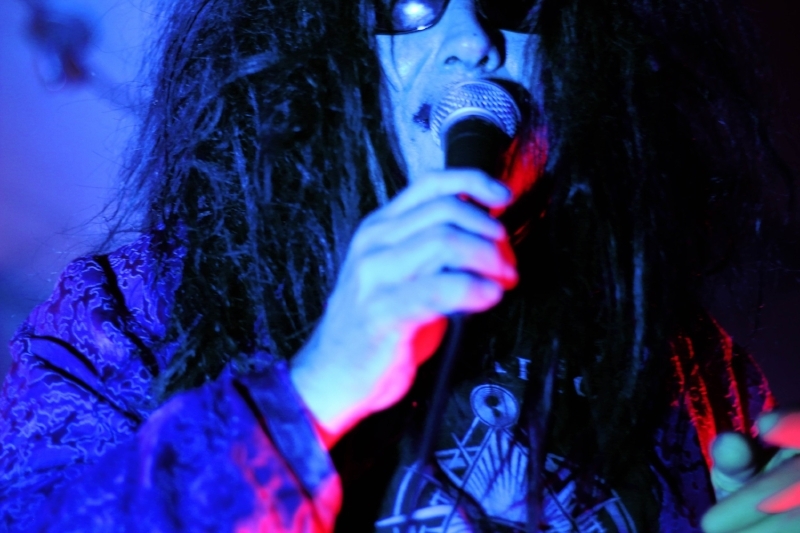 Gary Wilson and the Blind Dates will be performing at Part Time Punks in L.A. with Drinking Flowers, and at the acclaimed Desert Daze festival in Joshua Tree. Coincidentally enough, other like-minded acts which have shared billing with Gary in the recent times, including Foxygen, Cellars, and Sloppy Jane, will also be performing at the desert music festival. Thanks, as always, for tuning in. More soon!